Jalapeno originated in Mexico. One of the most common chili peppers, jalapeÃ±os are green when picked and are usually used while green, but jalapeÃ±os will turn red as they ripen, both on the plant and after they’ve been picked. They can be eaten when red, too, though they’re no hotter when red, but their flavor is somewhat fruitier and less grassy. 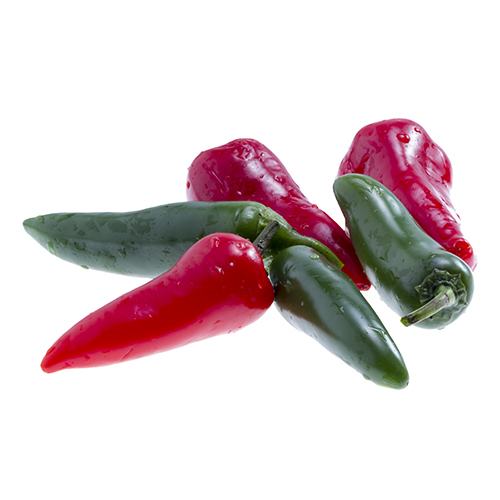 JalapeÃ±o peppers are medium-sized chili peppers with a mild to moderate amount of heat. Many people think of the jalapeÃ±o as a very spicy hot pepper, but in terms of the Scoville scale (measurement of spicy heat), the jalapeÃ±o is merely mild to moderate. Most people can enjoy a jalapeÃ±o, it’s one of the great culinary peppers in the world. JalapeÃ±os can be roasted, pickled, filled, or stuffed, making for a wide range of culinary options. JalapeÃ±os stuffed with cheese, breaded and deep-fried are a popular appetizer. JalapeÃ±os can also be pickled and served as a condiment. In addition, jalapeÃ±os are widely used in making salsas, sauces, and bottled hot sauces. JalapeÃ±o peppers can be dried and smoked, in which case they are called chipotles. Chipotle chilies can be ground and used as a spice. JalapeÃ±os may not be the fiercest of chilies but they lend a nice spark to marinades, jellies, and cheeses. Try them raw, roasted, lightly sautÃ©ed, or pickled and notice how the heat level and flavor subtly changes with different preparations. ereas direct seeding in the fall should occur approximately 120 days prior to the first frost. For jalapeÃ±o growth specifically, the combination of hot days (85?-95?F) with cool nights (65?-70?F) provides the optimal environment for high fruit yield. For spring jalapeÃ±o planting, harvest will occur in June. For fall planting, harvest will begin in October and last until the first frost. Time until harvest will also vary depending on whether jalapeÃ±os were grown through direct seeding or transplanting. Harvest for direct seeding crops will occur approximately 110-120 days after planting, whereas transplanted crops will be ready after approximately 75-85 days.